PowToon is web-based animation software that allows users to quickly and easily create animated presentations by manipulating pre-created objects, imported images, provided music and user created voice-overs. To get started all a user needs is to sign up with their Google account and they are good to go. If you don’t want to start from scratch, there are a few free templates that you can tweak and revise as you see fit. Using this tool is straightforward and the user receives guidance as they create. This tool fits under the “create” level on Bloom’s Taxonomy, and under the Redefinition category of the SAMR framework. Students can create animations to present projects, share research findings or retell the facts of a story they are learning about. This capability comes in handy when attempting to differentiate your instruction. For example, PowToon could be one of many ways you can ask students to demonstrate their mastery of a concept. 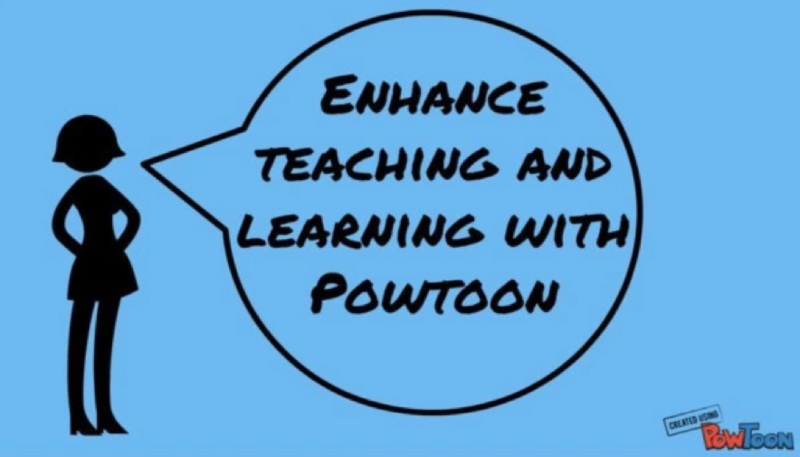 Creating an introduction to a new unit or providing instructions on an in-class project are great ways to use PowToon in a flipped classroom setting. You can also make a video list with accompanying student resources that incoming students can watch over the summer. If you are not sure which students will be designated to which teacher, you can create these as a content team and then make them available to all students enrolled to take a specific class.